I have a certain fascination with clothing labels and I'm not talking about the size labels either. When I get out (which isn't much lately) and go shopping, my heart skips a beat when I see the inside of a garment with sweet little finishing details and a sweet little clothing label. I go a little nutty for details like that. 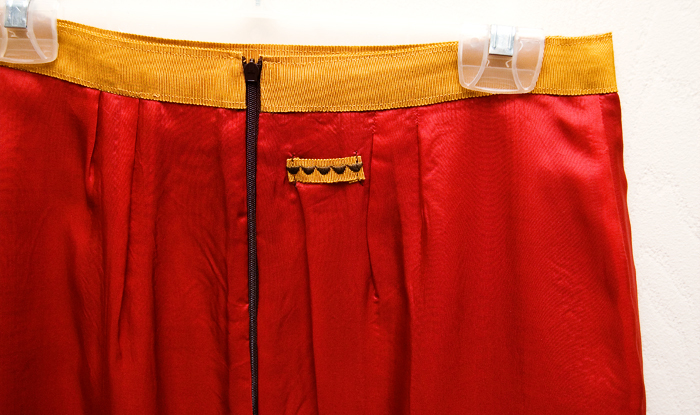 I'm also a true believer that the inside of a garment should look as good as the outside. It's something that really excites me. I know its not everyone's bag, but I truly find value in a well finished garment. 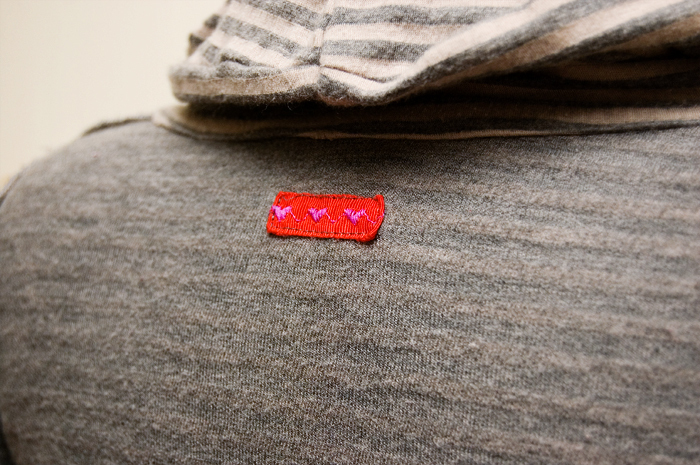 Clothing labels add a little frosting to the inside of the garment. A little bling if you will. I've tried many versions over the years including store bought labels, customized labels with my brand name on them and handmade labels. The sad thing that's really put a stop to purchasing customized labels with my logo or name on them (besides price) is that they're itchy! I hate that! Every time I've put one in a garment, I take it right back out because it itches. A few months ago, I had the hair-brained idea that I could make fun little labels with petersham ribbon. I love petersham almost as much as I love clothing labels and I admit that much of my love comes from the amazing color output it has. Truly, if you haven't laid your hands on some yet, you need to because the color of rayon petersham ribbon is truly amazing (I've noticed the cotton variety is a bit duller and stiffer than rayon). At first I was just going to sew-in a little bit of petersham ribbon as the clothing label, but then I took a double take at my sewing machine and remembered that I have about a trillion stitches on it that never get used. How many of you have that? I'm surprised that I can't just put a piece of fabric into my sewing machine and have a garment pop out the other end! And I have a lower end machine that has embroidery stitches - Bernina Activa 230 anyone? I ADORE my machine, but were I to do it all over again, I would probably purchase a machine that is just more functional and has less stitches. I don't know. Then again, I'm very attached to her - and yes, my machine has a gender. So there you have it - a billion different types of machine stitches and petersham ribbon and Voila! Instant little clothing labels. I use the 1/2" petersham ribbon, but I'm sure you could easily utilize other widths. I stitch a long piece of petersham at a time and then cut them down to size and sew them into garments with each raw edge folded inward. What's more, these little guys are not itchy at all. In fact, I don't even notice that they're there when I'm wearing the garment, and that's serious props in my book. And they add the perfect amount of eccentricity and whimsicality to the inner workings of my barely finished garment. Do you love clothing labels as much as me? Aren't these cute? Ever tried doing something like this before? You need to. I think you'll love them just as much as I do! The next time I have to buy a new sewing machine (and I hope that far far away in the future...don't die on my dear sewingmachine!) I'm going to buy one like that just because it has a heart stitch, so cute! Such a nice idea. I don't bother putting tags in clothing I make (although I really should for the cowl Renfrews, it's hard to tell which side is back with the cowl) but I did put a loop of ribbon in my pj bottoms from the pajama sewalong. That has made dressing in the dark easier if my husband goes to bed first. I always put a tag when I give a gift. I have some cotton fabric that has thin stripes, I cut it down to 3 stripes and use fabric markers to put a heart and my first initial. I like this idea of decorative stitches. What a great idea...love the little embroidered details! Brilliant idea! I'm going to shamelessly copy it! Oooooh, brilliant! I tots want to try this. Thanks! I'm a nut for tags too. I love them! (except in lingerie from which I remove them immediately). This is a fantastic idea. I'd love it if my (basic electronic) machine could spell out my name - alas, it can stitch all kinds of cute embroidery, but not letters. Just found your blog, very cool! I will catch up as time permits, somehow I found myself in the middle of it, not in the current today what you are doing place. Don't ever use an invisible zipper, they are worthless for all the reasons you suggest. And I am going to start making labels, the way you suggest, and even see if I can get my name on them. 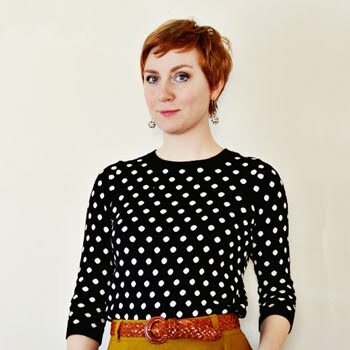 I have been marking the back of things, like a skirt, pants, or shorts, with just a piece of bright grosgrain or Petersham horizontally across the back center seam, for designs that are not easily identifiable as the front or the back, like pajamas, or a skirt with an elastic waist. But now I think I will add some design to that ribbon first! The hearts are adorable!! Ribbon is such a fun choice. I've only labeled a few things- a couple items with iron on labels (only cottons b/c it requires a high heat setting and not many b/c I forget to do it before sewing it up) and a few with zigzagged extra fabric tags. I did sew a little bit of ribbon to the back of my husband's pajama pants so he could identify the front and back. Great idea as always! Going to try it for some market stall items I am making for Xmas..I only need 20 and buying labels is difficult. At last! A use for all those stitches - thank you. That is so true - stitches I never use! Well, now I know what I'll be trying next. This is such an awesome idea. I have done the same thing on something like seam binding. I made dress shirts for my sons and made labels with their initials and age (no! it looks really cool: for ex. NLS16) using the alphabet program on my machine. I love the idea of using Petersham, though--thanks for the inspiration! I started putting labels into garments for Lila... It helps her when she's dressing herself in the morning, so she knows which side is the back. But you're so right! I started doing it for other garments because I just like the way it looks. It's sweet, like you say, and so simple to do... Right now I'm working through a stock of black and white striped ribbon, so all my clothes from around now have this marker... When I run out, I'll go for something completely different. Thanks Sunni for this awesome post. 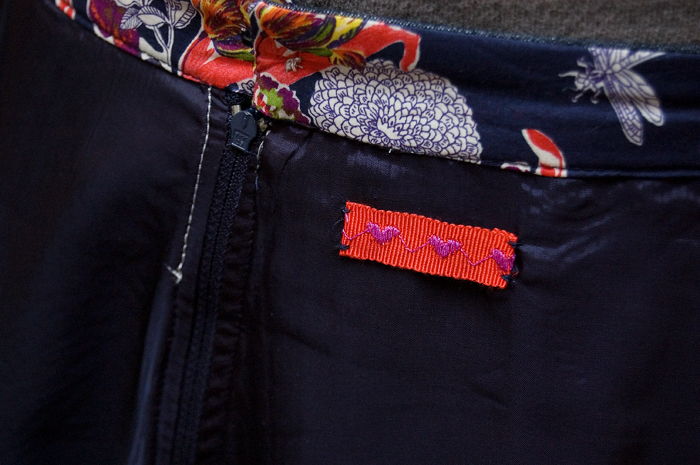 My heart skips a beat also when I look inside a garment and view a cute little label! This is really great information! Great idea! Do you use a carrier or just the ribbon? I'm worried that my machine might "eat" the ribbon. Thanks so much. Great idea. I might hand embroider some labels with the sizing in so I don't forget. Another thing that I'm finding with skirts is that ones I sew if I've run out of those hangers with clips I can't hang them up. 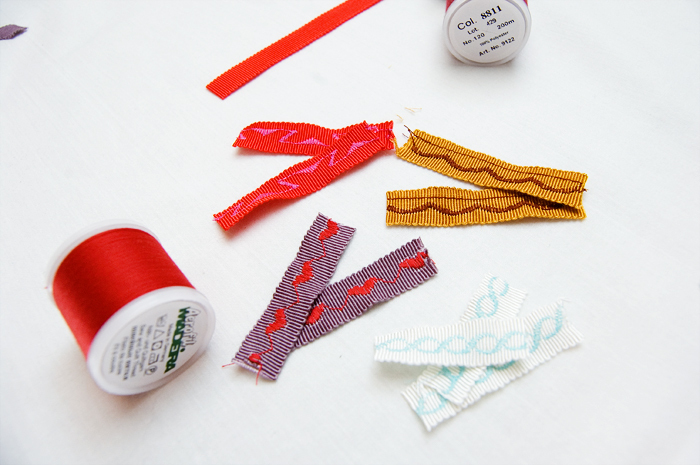 Have started adding ribbon loops like you get in RTW clothing.